Bowls can be much more than functional. They also can be artistic!! They don’t just need to be single wood salad bowls, think of natural edge bowls, pierced bowls, multi-sided bowls and even segmented bowls. There are many ways to make bowls that are unique and will be a testament to your skills and creativity! Turning wooden bowls has been practiced for thousands of years. It originated with simple tools being used to make utility bowls for food storage and preparation. Since then the equipment available for woodturning may have improved but the basic principles are still the same. A simple turned wooden bowl shows off the beauty of the wood and always seems a natural use for a natural material. The flowing curves give a simple elegance that echoes the characteristics of the wood and makes good use of what nature gave us. Each wooden bowl shown here has been turned and finished by hand and each one is unique. Some bowls are turned to be thin and delicate and others are thicker and more robust. The characteristics of the wood are used to define the form of the turned bowl. Some of the turned wooden bowls are made from spalted timber. The term “spalted” is a term which describes wood affected by the natural process of fungal attack. If caught at the right stage, the fungal attack leaves striking colours and lines without significantly degrading the structure of the wood. Once the moisture content in the wood has been reduced to levels found in a normal indoor household environment, the fungus is no longer able to survive and the process is halted. 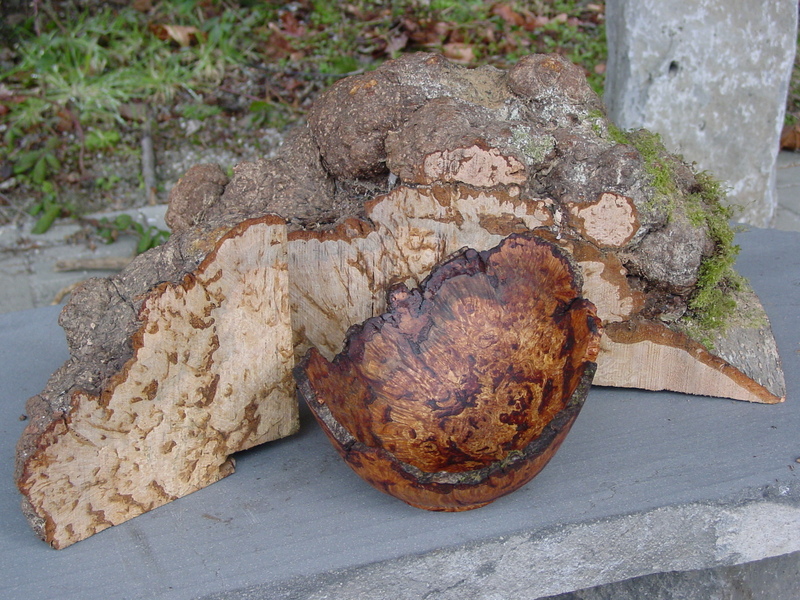 Spalted timber is often used for woodturning because of the enhanced appearance of the wood. Brown oak is also caused by fungus. In this case, the beefsteak fungus (fistulina hepatica) is the culprit. The fungus lives on the outside of the oak tree and feeds from the sapwood. The fungus passes its waste products back into the tree and this reacts with the tannin in the wood to produce the rich brown colour sought after by many woodturners.